Wow, what a day! So full, I”m not sure where to start…. so many joys in today… so much to praise God for! This morning started after a great night’s rest. YAY! 🙂 … and a few bug bites 😦 Breakfast included fried dumplings, ackee fruit with fish (ackee is the national fruit though it’s not really what we think of as a fruit. It doesn’t have much taste but rather is used somewhat like tofu where it takes on the seasonings and spices of what you cook it with. ), eggs, and fruit. 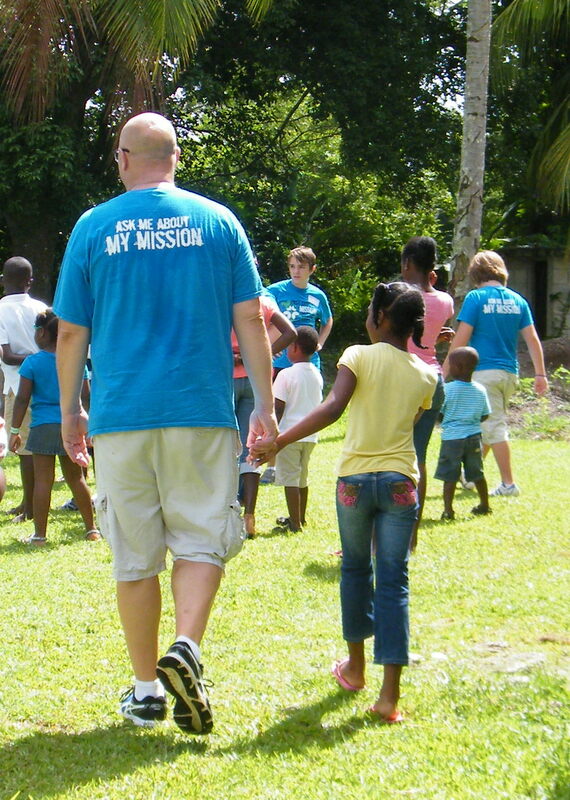 We headed right out for VBS. The day started about 30 minutes late and with only 10 kids, but ended with nearly 60! It was such a joy for me to see all the participants leading the stations they’ve been preparing so long for and to see it all come together. A special joy was seeing Britney, a girl we met at church the day before. She especially loved spending time with Mr. Stone. Britney’s brother Popsie also joined us despite some hesitations due to needing a walker and not having much use of his legs. He’s had countless surgeries in his few years already on earth. One of my favorite moments of the day was seeing Gina sit with him making a bracelet while the other kids were doing a game he couldn’t really play. We had a good debriefing time trying to figure out what changes might need to be made for the net day while eating some more Juci Patties for lunch. Megan and I began our visit with a bed-ridden woman named Mary. She couldn’t talk with us too much but we had a chance to both read some Scripture to her and pray over her. I wish I could remember the name of the man I met near the end of our visit in the men’s ward. He was unable to talk really but was able to communicate to use through motions that he had had a stroke and was trying to recover use of his right side of his body including his ability to speak. I would guess he was in his 50s or 60s. Much of our group had gone further down the ward when I began talking with him. When asked if he’d like me to read some Scripture, his face lit up and I began sharing some favorite verses from Psalms and Isaiah. After a few chapters I asked Becca and Paul to come read some more. While they were reading, I held the man’s hand. It felt as if every verse they read his grip got stronger and stronger and his face less and less weary. A funny moment came with Paul was reading Psalm 91. He stopped part way through and the man motioned to him with a look on his face that communicated, “I know that’s not the end… keep reading.” The motion was repeated for the next few chapters anytime Paul stopped. This man was truly savoring every moment he could with people and hearing God’s Word. You could tell he was dependent upon it to stay in the fight toward healing. It was difficult to leave his bedside wondering when the next time would be he would have visitors. Meanwhile, a large portion of our group found themselves talking with two young men in their 20s. The other team members could probably give more specifics about their interactions with these guys but from what I heard one of them was 17 when he fell out of a tree and was hurt so severely that he was till here at the infirmary now at 21. We couldn’t fathom the fact that he would likely be there, in that bed, in that place the rest of his entire life. Many of us were just at a loss of words. How do you encourage people who have been abandoned by their family or don’t even really have one to begin with and will spend the rest of their days stuck in the walls of the infirmary?!? My last encounter was with a group of 3 women Sarah had been talking with for nearly and hour. I had to laugh at the request the one woman had when asked if I could read any Scripture for her. She wanted Judges 4, especially the part about the woman Jael killing a guy by hammering a tent peg through his temple. Let’s just say the conversations that ensued was quite humorous. These women were awesome and had some courage and determination just like Deborah and Jael in Judges 4. When Dillon came to get us to tell us it was time to leave, they refused to let us leave! We eventually were able to make it out of there and it was nice to end such a tough afternoon with some laughter. We ended our time at the infirmary presenting the matron with donations from both groups. We were able to leave two suitcases full of towels and toiletries that will be a huge blessing to all of the residents. We were definitely ALL out of our comfort zones but God met us there. 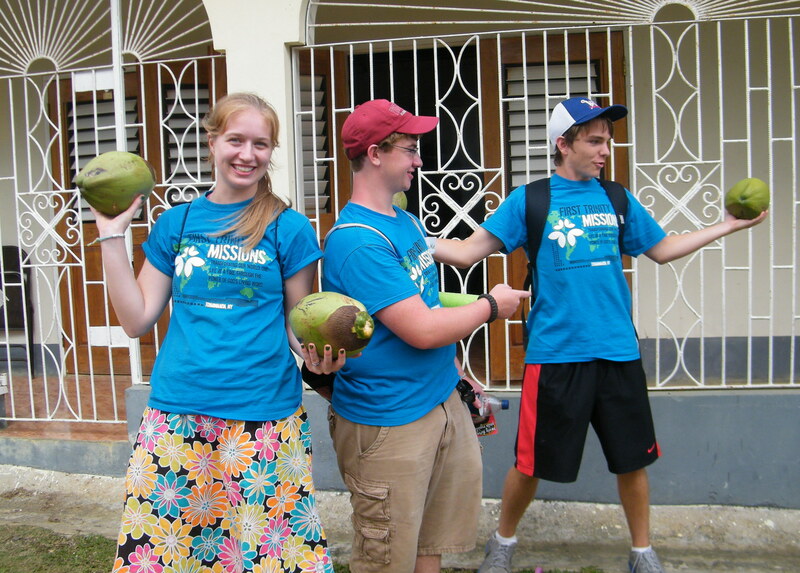 We came back to the church (Town Head Baptist – our home for the week), hung out, and experienced coconut water. I personally enjoyed some time recapping the day with two women from FBC Carolina Beach, the other group that was at the infirmary that day before dinner. Dinner was rice and beans, fried chicken, stewed beef, and potato salad (more like mashed potatoes with eggs). After dinner we all headed back to Fullersfield Church for our evening program. It was originally supposed to be Wednesday but since that was Jamaican Independence Day it got moved to Monday. 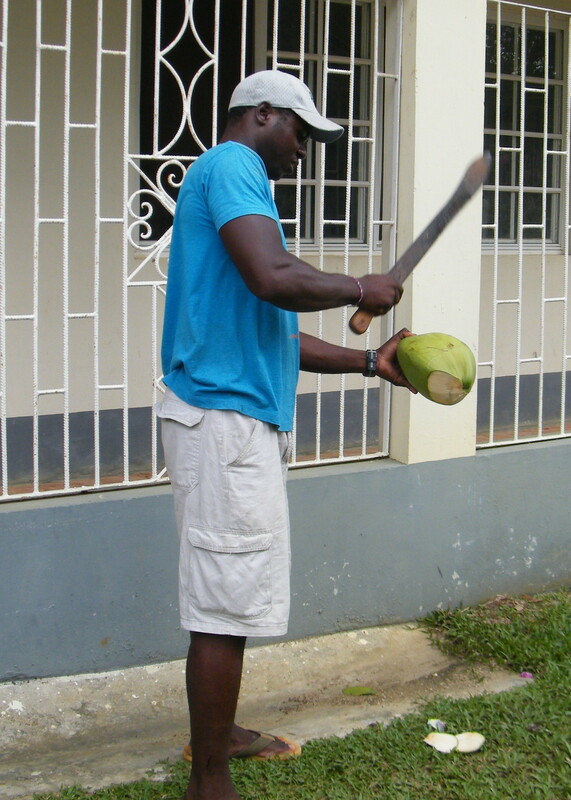 Dillon cutting open the coconuts with the machete! The FBC’s evening program got cancelled so they joined us tonight at our Family Community night which was so fun. We did games and activities about our theme “Wear Love” from Colossians 3:12-17. 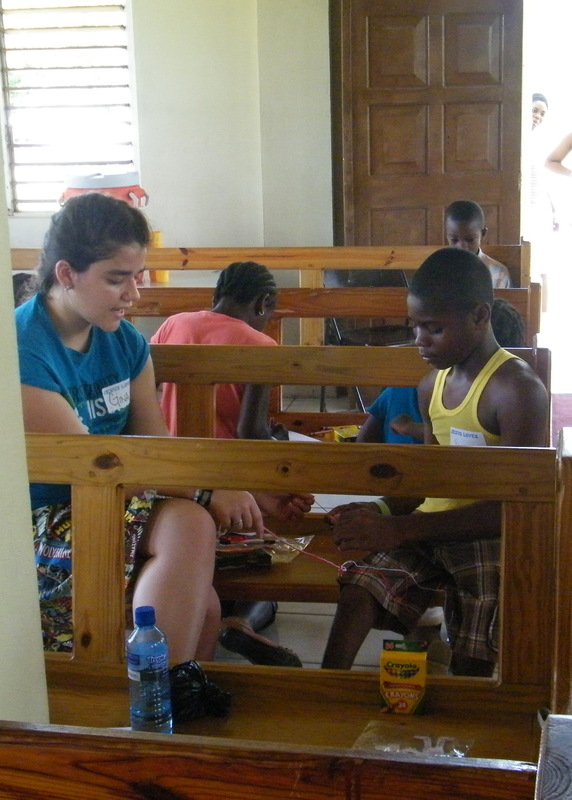 We taught them the game “electricity” before working to memorize Colossians 12 and 14. We ended the night breaking into groups by age and thinking about how we could apply these verses in our lives. It was a fun time to see the participants step up and lead each group! (Sarah especially had some fun keeping the PPM staff and other adults in line!) We ended the night with the challenge to take a card we brought with the verses on it and place it by your clothes. Each day as you get up and put clothes on, read through the verse and pray for God to clothe you with clothes from his closet… kindness, gentleness, humility, patience, forgiveness, love, etc. Ricardo (the team leader for all the teams this week) was excited that there were left over cards so he could use them for the sermon he was going to preach that coming Sunday. Because some of us got back so late, we did our debrief in the bus on the way back so we could just shower and get to bed.